The Concept X5 eDrive uses a four-cylinder gasoline engine with BMW TwinPower turbo technology coupled with a 95-hp electric motor. BMW will unveil an X5 plug-in hybrid concept next month at the Frankfurt auto show. The Concept X5 eDrive uses a four-cylinder gasoline engine with BMW TwinPower turbo technology coupled with a 95-hp electric motor. It also uses the automaker's xDrive all-wheel-drive system. BMW has not announced plans to build the car, but company sources say a production version will arrive in 2014. BMW says the concept can travel up to 19 miles solely on electric power, reaching speeds of up to 75 mph. The high-voltage battery is in a crash-safe position just under the load area in the back of the crossover, BMW says. The concept offers a choice of three driving modes: an intelligent hybrid drive option for a balance between sportiness and efficiency, an economy mode that will maintain the current battery charge level or a pure-electric mode. 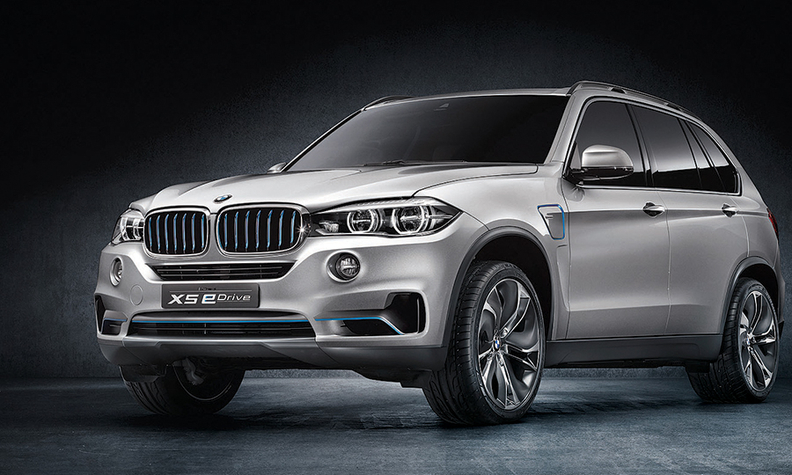 BMW says the Concept X5 eDrive can achieve the equivalent of 89.2 mpg. Unlike the i3 electric vehicle and i8 plug-in hybrid from BMW's i subbrand, the Concept X5 eDrive does not use ultralightweight carbon fiber and aluminum in its construction. But some styling features connect it to the subbrand, such as the special blue paint developed for the i family that is used on the grille.